The morning groups slugged it out for naught in an unrelenting rain until the greens finally went under around eleven o’clock. The final decision to wash out the entire round and cut the tournament to fifty-four holes didn’t come until after three. Luckily, plenty of food and hot drink awaited their arrival in the club house along with a few diversions. Carin Koch taking a turn on the provided iMacs. 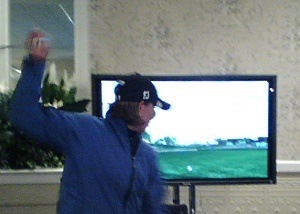 Tiger Woods PGA Golf was Katherine Hull’s favorite on the Wii. Bonehead move: The decision to play the ball down with rain in the offing was the main subject among players and caddies alike. Heard a few lambasted some of the officials for their lack of foresight. Home sweet home: Veteran looper Tommy Grogan grew up in the new York area and, in an effort to keep as physically fit as possible, tries to barter passes to the tournament for workouts at a local gym. This week, his offer was rebuffed with jargon he was oh so familiar with. “What do I want passes to a f—king golf tournament for? It costs twenty-five dollars to work out.” Heard it gave him a warm and fuzzy feeling to know he was back home. This entry was posted on Friday, May 16th, 2008 at 1:36 pm and is filed under 1. You can follow any responses to this entry through the RSS 2.0 feed. You can leave a response, or trackback from your own site. I blasted the LPGA’s decision to wipe out today’s scores on my blog, but wanted to ask your opinion – is this a decision with much precident behind it, and do the players agree with it? Anybody who played as many as 15 holes today (or was a couple shots under par on the day) might have a gripe, it seems to me. There is precedent and the sponsor must be on board. More than one factor must be considered and TV coverage is one. What is best for the entire group of players is another and considering the better weather forecast for tomorrow, the afternoon groups would have had a major advantage. Also, we’ll be playing it up. Didn’t hear one complaint. I spoke to an LPGA veteran today and she said she had never encountered a wipe out of scores. Any idea on what made them decide to do it today, as opposed to other times? I know one for sure. In 2005 I worked for Laurie Rinker in Williamsburg and we had similar conditions. We played in the slop and was one under after eight holes before they stopped play. They washed it out and we shot 77 the next day and missed the cut. That one I remember very well.